From Tamashii Nations. Introducing the world's most posable Bruce Lee action figure! 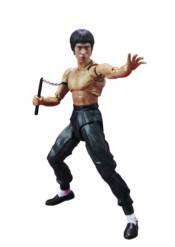 Using advanced S.H.Figuarts articulation technology, you can reproduce all of Bruce Lee's powerful martial arts moves! Aiming for total realism, Tamashii Nations utilized highly advanced facial digital coloring technology to capture every detail. Bruce Lee fans will be impressed by the incredible sense of reality maintained in such a small figure. Set includes several trademark weapons to capture the on screen action including a nunchaku (nunchuck) and two staffs (short and long). Other accessories include 9 interchangeable hands and 2 interchangeable face parts.